What does the ‘Blood Curse’ of Matthew’s Passion teach Christians? What enters history as the “Blood Curse” is only found in the Passion of St. Matthew. In all the Gospels, Jewish leaders in Jerusalem are implicated in the death of Jesus, though in the Gospel of Luke, the crowd itself, composed of common folk, is sympathetic to Christ. 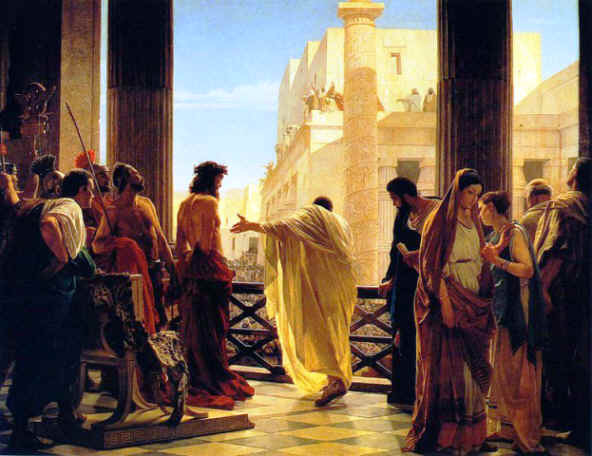 In all four Gospels, before sentencing him to death, Pilate declares the innocence of Christ, but only in Matthew does the crowd react so strongly to the procurator. “His blood be upon us and upon our children” (27:24-25). A strain of Christian thought has viewed this reply to Pilate as a self-pronounced curse on the Jewish people for the Messiah’s death. Martin Luther’s 1543 treatise “On the Jews and Their Lies” called for the burning of synagogues and Jewish homes. “We are even at fault for not striking them dead,” Luther wrote. Like other Christians of his time, including Catholics, the reformer also endorsed the blood libel—the legend that Jews kill Christian children for ritual purposes. This is what comes of focusing upon one line of Scripture rather than upon the merciful Christ, to whom all scripture testifies and by whom all Scripture is interpreted. The Gospels are more than histories; they are discipleship manuals. We are meant to find ourselves in them, our strengths and our hopes, our fears and our sins, our weaknesses. St. Ignatius of Loyola understood this when he urged his followers, in prayer, to imagine themselves as all of the persons in a given passage. Praying over the Gospels, each Christian should realize: part of me accepts Christ; part of me scorns him. Praying over the Gospels, each Christian should realize: part of me accepts Christ; part of me scorns him. Stretch the perspective lens to include all of Matthew’s Gospel and one finds this pattern of recognizing our own interior rupture quite apparent. In his infancy narrative, some Jews accept the new born king: Mary and Joseph. Some reject him: Herod, the chief priests and the scribes. The same is true here: Joseph of Arimathea, Mary Magdalene, the women and the disciples receive him; the chief priests, the pharisees and the guards reject him. Remember that the Gospel of Matthew was composed by Jewish Christians, who had so recently undergone the terrible trial that was the destruction of Jerusalem. Families were rent asunder over the questions of Jesus and Judaism. Matthew’s Gospel reflects this internal, terribly painful debate, making all the more poignant Matthew’s repeated insistence that even gentiles, properly disposed, can recognize and receive the Christ. Scripture, cut and pasted, has no authority. Again, the pattern is pervasive. In the infancy narrative, the gentile magi come to pay him homage. In the passion narrative, Pilate’s wife, a gentile, receives a revelatory dream about the man who stands before her husband. Some have, intemperately, suggested excising this passage, but Scripture, cut and pasted, has no authority because those who wield the scissors have already established themselves as the final arbiters. Jesus does not overwhelm. He woos us instead. No, we should see this passage as early Jewish Christians recognizing their own, internal dividedness, not simply within their families but within themselves. It is a division that remains in every human heart on this side of the grave. Oh, then take my heart away! Bach implicates us all. We hate Christ; we fail to pity him. Yet, how can we not be softened by the sight of his suffering? How can it not move our souls? It does move us, surely, but is it enough? On our part, no. On the part of Christ, yes. Thank you for a remarkably well written and scripturally based commentary. (How did it ever get published in America?). I enjoyed reading it and felt blessed by it. Any isolated passage from scripture that establishes an " us versus them" or a "we are good, they are evil" dichotomy, goes against the central message of the gospels, which is that God loves all of mankind in spite of our sinfulness and brokenness. As Richard Rohr often comments, "God doesn't love us because we are good, He loves us because He is good." Offering a personal point of view, I believe that I, along with every other human person are collectively guilty of and under the "Blood Curse." We said it, we did it, first because the curse of human sin my sin, our sin, caused the shedding of Jesus's Blood. His Blood is upon us and on our children because we have all sinned, a "Curse" that became a "Blessing" in that through that "Curse" we have been offered salvation, nothing less than an opportunity to "partake" of the Divine Nature, to share Divinity! My God, how great You are! The choice ours to accept, or reject. So as wrong as he has sometimes been, St. Augustine is right again borrowing from St. Paul, when he said, "For those who love God all things work together unto good, EVEN SIN!" Package this in another on target thing Augustine said, "Everything is Grace," yes, "all things" not "some things" "working together" and "not separately" unto Good, another word for Grace. Reflectively then, don't blame the Jewish leaders. its people. blame us, We did it. Thanks be to God for finding the way to make even sin spiritually advantageous, a snapshot of the ever merciful God, fingerprinting Hope in whatever He touches. I suggest a more helpful interpretation from theologian James Alison in his book, Jesus the Forgiving Victim (p.252). Alison describes the Day of Atonement ritual in the Jewish Temple, which includes sprinkling the people with the blood of a sacrificed lamb. So the passage in Matthew recalls this, perhaps with an ironic intent, that the people are recognizing a rite of atonement about to take place, and are becoming participants in it and calling down upon themselves and their children the blessings it entails. So they are calling down upon themselves a blessing, and not a curse! James, I understand what you posted and I like it - the Blood of the Lamb of God, Jesus, was called down upon people and their children on that Day of Atonement, Good Friday and those who did the calling were included. A perfect fit for Jesus the Forgiving Victim. the Divine Arranger. Terrance Klein is a priest serving in the Diocese of Dodge City and author of Vanity Faith.